Brian Clegg is a British popular science writer. His books have included The God Effect, Before the Big Bang, and Inflight Science. His latest title is How to Build a Time Machine. My reading involves a lot of popular science for research and reviews, and most recently I’ve enjoyed The Quantum Universe by Brian Cox and Jeff Forshaw. Cox has recently received a lot of media attention in the UK, becoming the best-known TV science presenter after David Attenborough, which is reflected in the book’s sales, pushing into the bestseller list. I loved the book, but a lot of those readers are going to be dissapointed. This isn’t the light and fluffy popular science of a TV show, it’s real, in-depth and gritty stuff. Allegedly many of those who bought Stephen Hawking’s A Brief History of Time gave up pretty quickly. By comparison with The Quantum Universe, Hawking’s book is an easy bedtime read. I think the ideal use of this book would be as a primer for someone about to do a physics degree. It has a lot of meat – but it’s not really popular science. I try to alternate with something lighter. Often this is fiction, but the most recent bit of light relief was the non-fiction title The Etymologicon. 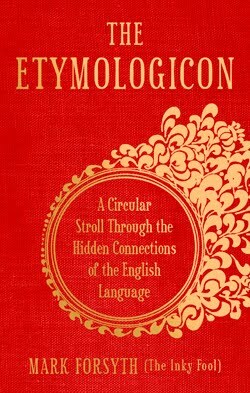 As the name suggests it’s a book about the origins of words, but it’s nowhere near the yawn that this topic might suggest. Author Mark Forsyth piles in the fascinating factoids and keeps the whole thing light and entertaining. He opens up many surprising origins of words (did you know that the game of pool got it’s name from the French word for chicken?) and keep up a relentless flow of new information that made me want to read ‘just one more’ time and again. It’s clearly formatted as a gift book, but this is a book I’d happily give to myself. Follow Brian Clegg on Twitter, and visit his website and blog. Writers Read: Brian Clegg (September 2009).